My apologies for rescheduling our Facebook Live last night. Britni and baby Klas were visiting on Friday and as I was coming down my wood stairs, I slipped down three of them. Thank God I was not holding the baby when this happened! I've spent the rest of the weekend hobbling along trying to calm down the pain. Check out the new Facebook Live date and time below. Walking Through Conflict series continued last week with Sarah and Deimile's stories. These two women from opposite sides of the world both spoke about wake up calls, big decisions and parenting. You can still read their stories on the website or click on the links below. This week Britni and Kaitlyn share their conflict stories that will be equally moving so be sure to share and comment after you read. Our May series is In honor of Mother's Day. We are welcoming stories about the women in our lives who have made it brighter by being a part of it. Share your stories about your own inspiration of being a mom, your struggles of wanting to be a mom, the women in your life who were a mother figure to you or any women who changed your life for the better. 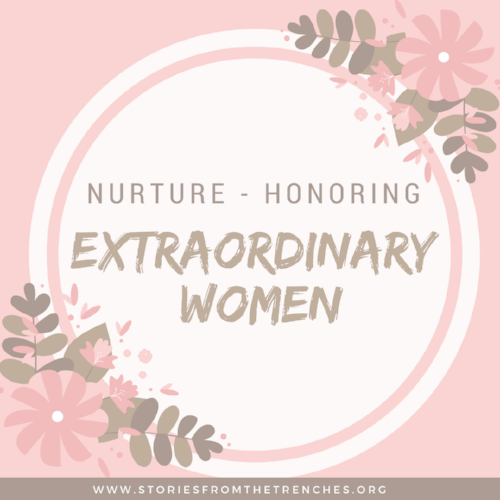 We are calling this series Extraordinary Women for all the ladies that have shaped our lives forever. Begin your story submission here. Our new Facebook group is up and beginning to grow! However, I am not finding the time to cultivate conversations and move the group forward. Would you be interested in being an Admin for our Facebook group and helping our community connect with one another? If so, please email me at jen@storiesfromthetrenches.org. Join me for our rescheduled Facebook Live on Sunday, April 29th at 8:00 P.M. Central Time. I will be chatting about our conflict series, new Facebook group and upcoming stories series. Besides the stair fall, my 24 hours with Britni and baby Klaus was perfection (though I will add how fast 24 hours goes by and definitely not enough time). Klaus is the chillest baby and just so so cute. There were sweet aunt moments that just melted my heart and of course time with Britni is like fresh air breathing into my lungs. I hate that we live so far away from each other but grateful for Facetime, videos and Facebook to keep up with them. Conflict - A Mother's Love or Selfishness? I am in conflict with myself over helping someone in need. Am I helping them selflessly or for my own personal benefit? Let me explain..